A bodkin is essential when basketmaking. It is useful to have several in several sizes and diameters. 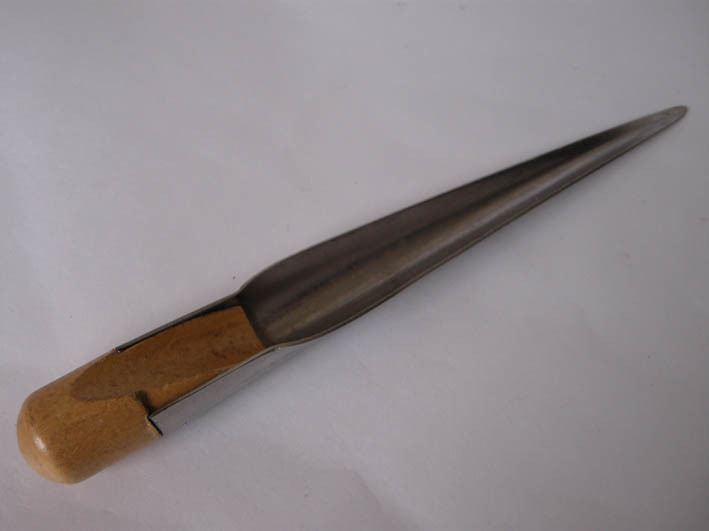 A good general purpose bodkin has a metal spike that is around 5” long and that tapers gently towards the tip and a wooden handle. (When buying the size usually applies to the length of the metal spike). Larger bodkins are used when inserting handle bows in the sides of the basket. A fine bodin is good for small work. An awl is usually all metal and does the same job. Sometimes you need to rap down on the wooden end of the bodkin when working so it should be strong enough to take this treatment. 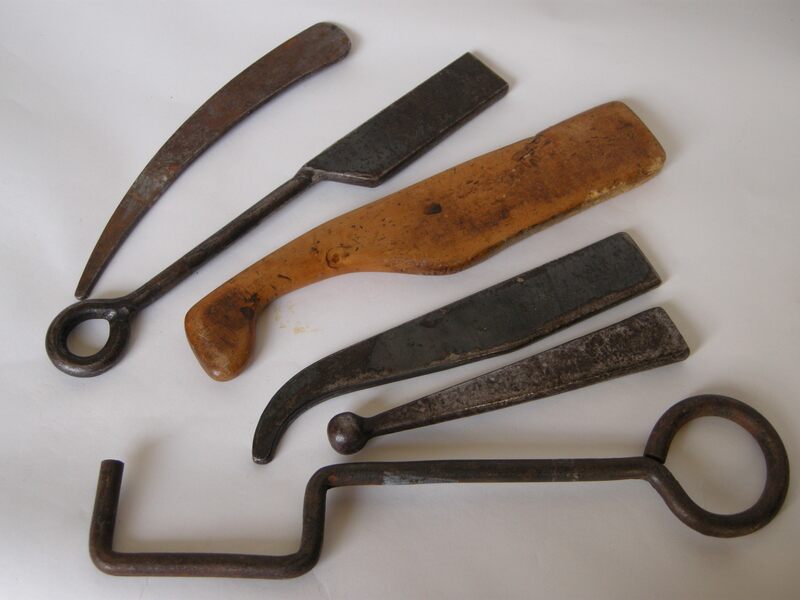 A selection of bodkins of different sizes. 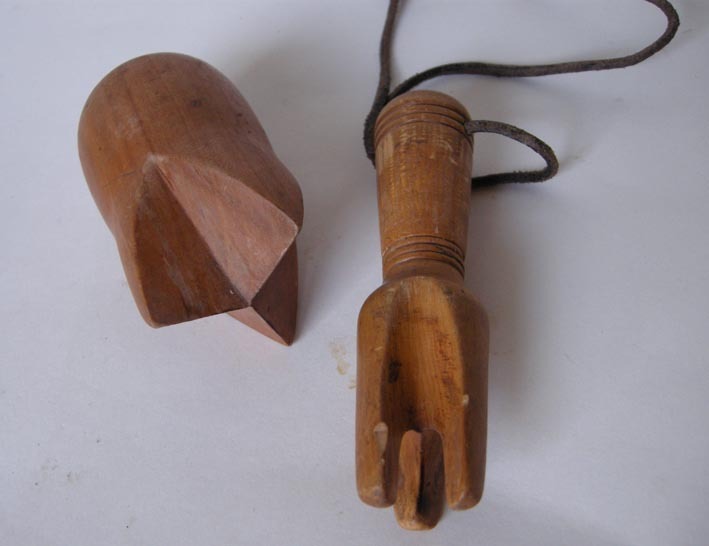 A fid is a tool used in rope and sail making. It can be a useful tool for basketmaking because it has a hollow side that allows you to thread a willow rod through without taking the bark or skin off the willow. 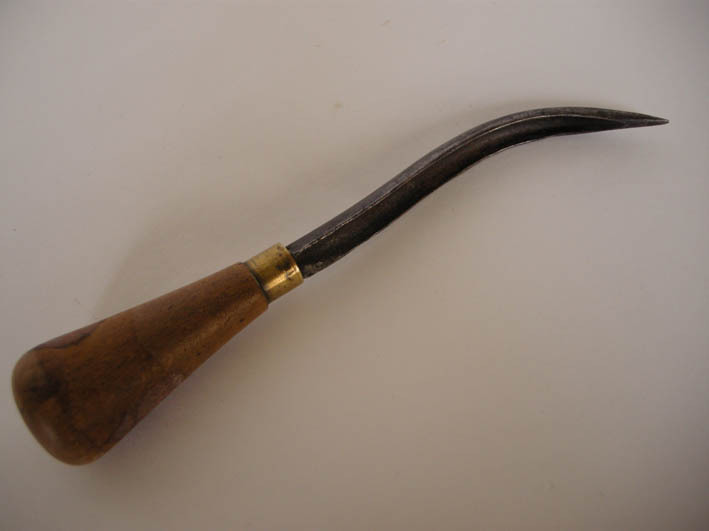 A shell bodkin performs the same task, this tool is commonly used when seating a chair with cane. This tool is used when stripping the bark from the willow rod to produce white willow. There are several designs, two pieces of metal are sprung together so that the rod can be pulled through. It is held firmly in a post in the ground. Stripping may also be done by a machine but in the past women and children did the white willow stripping rod by rod and this always took place in the spring when the sap was rising using rods that had been overwintered in shallow ‘pits’ of water to keep them alive. 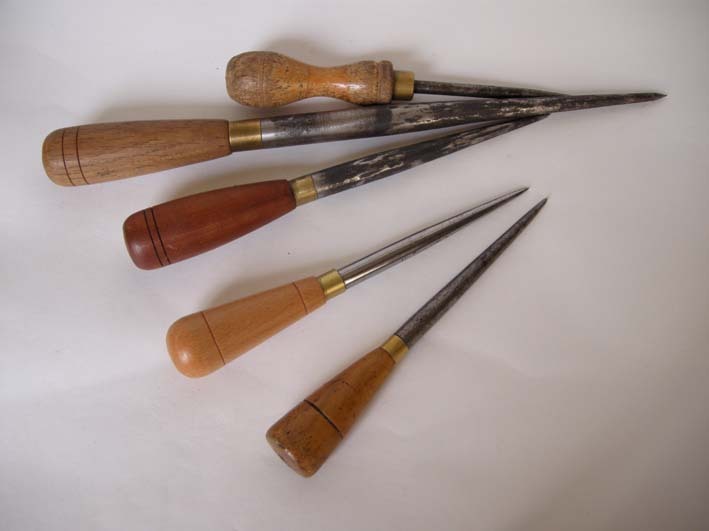 Generally made from wood, these are used as aids for shaping. They range from simple hoops that can be attached or put around the uprights to keep them in position to moulds that help to form complex shapes. 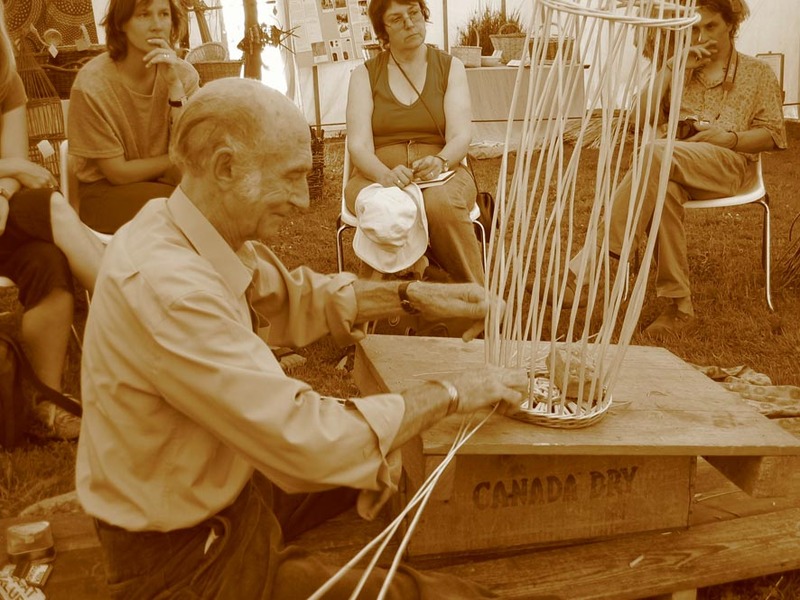 A thick willow rod may be formed into an oval around a shape cut out of ply or a lobster pot may have the ‘mouth’ made by inserting rods into a thick wooden post. 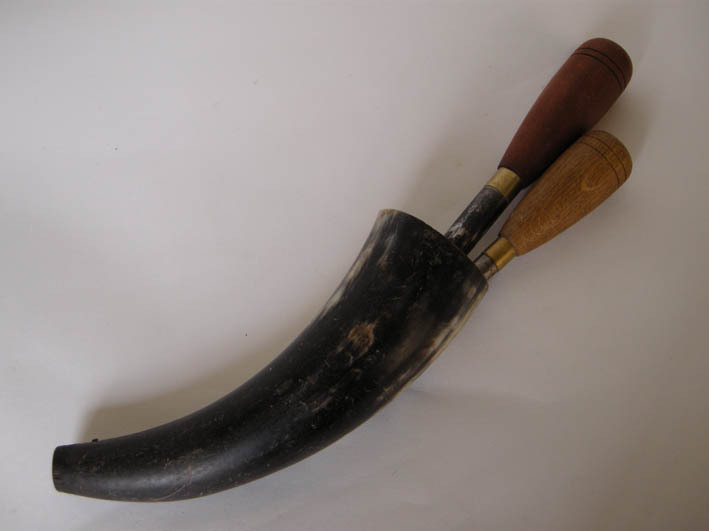 This was usually a cow’s horn filled with a mixture of tallow (animal fat) and horsehair. The bodkin was inserted in this before using it and the tallow made sure that the bodkin was ‘greased’ which helped when inserting stakes into a base or a bow for a handle. 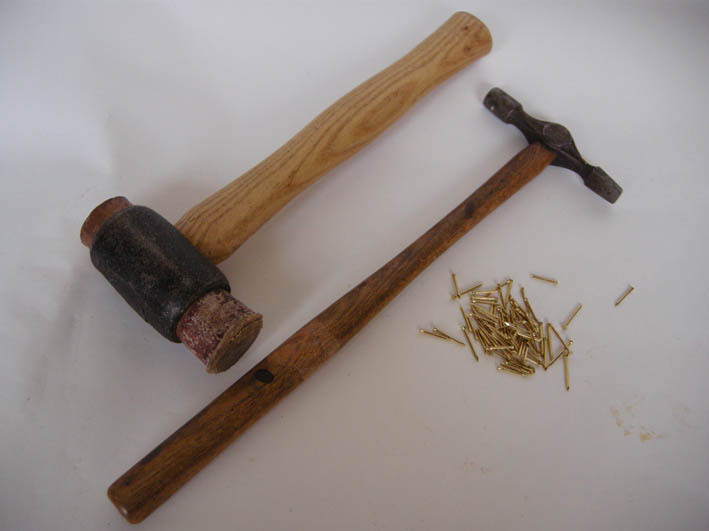 A small woodworker’s hammer is used to tap in small pins to secure the weave on a lid or when there is a post with a discontinuous weave for example on the gap of a dog basket. In square work a hammer is used to knock the side stakes into the thick outer sticks of the base. For this a hammer weighing at least 2lbs with a leather head is most suitable. A shop knife was usual in the workshops. A suitable knife for basketry could have a straight or curved blade. 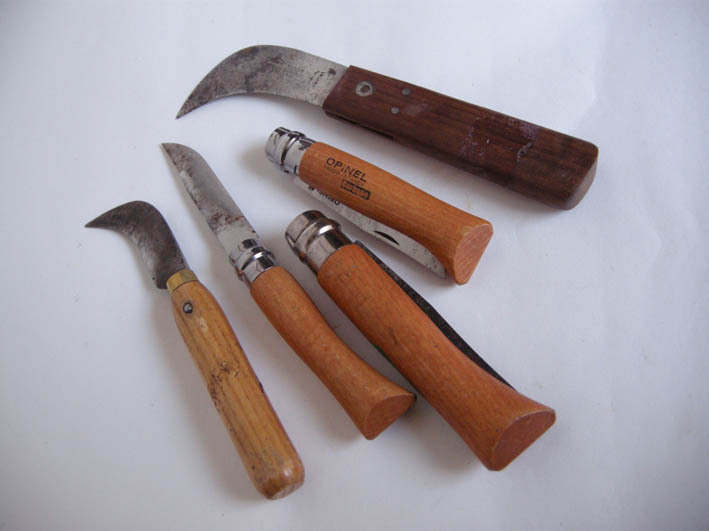 Straight bladed knives were more common in England, curved ones in France. When choosing a knife suitable for basketry, it should be strong and fit the hand comfortably. An Opinel knife found in most good hardware stores is suitable, always remember to lock the blade so that it can’t fold up on your hand. Knives should always be sharp in order to cut safely, a whetstone or diamond sharpener is essential. This knife with a curved or outward facing blade was used for ‘picking off’ or trimming any unwanted ends of willow once the basket was finished. It needed skill to press down and only cut the rod that was to be discarded without cutting through the weave. 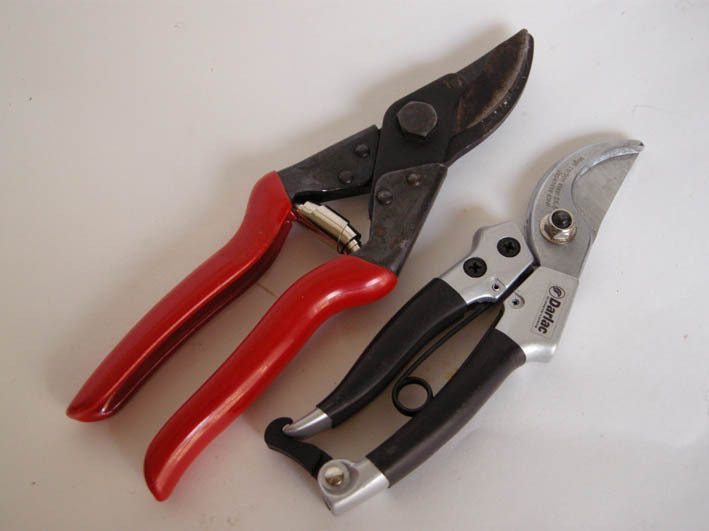 Today shears or secateurs are generally used instead for this job. Sitting ‘on the plank’ is the traditional way of working. The plank is a long board, a general measurement would be 6’ long x 2.6” wide. It sits a little above ground level. The basketmaker sits at one end of the plank on a thick cushion with legs outstretched and the ‘lapboard’ on which the basket is woven is held on his thighs at one end, at the other it sits on the plank. In this way the willow rods are to hand, on the left hand side, and the tools are on the left. The underfoot bases of the baskets were also made ‘on the plank’ with the maker standing on them. Colin Manthorpe sitting on the plank making a herring cran at the 2003 Basketry and Beyond Basket Fair and Water Gala. The lapboard is raised up on a wooden box. Today basketmakers often choose to have a bench or an arrangement that allows for a variation of heights at which to work because working on the plank is very hard on the back. The ‘lapboard’ is a smaller board (sizes vary) with an extra piece of wood at one end so that it sits higher at the front than the back and sloping towards the end of the plank when the basketmaker has it in position. It may have a series of holes drilled down the centre where the basket can be pinned down using a bodkin. The basket is held on the lapboard so that the maker is looking at the sides and not down on the top. These tools are used to compact the layers of weaving by beating them down. 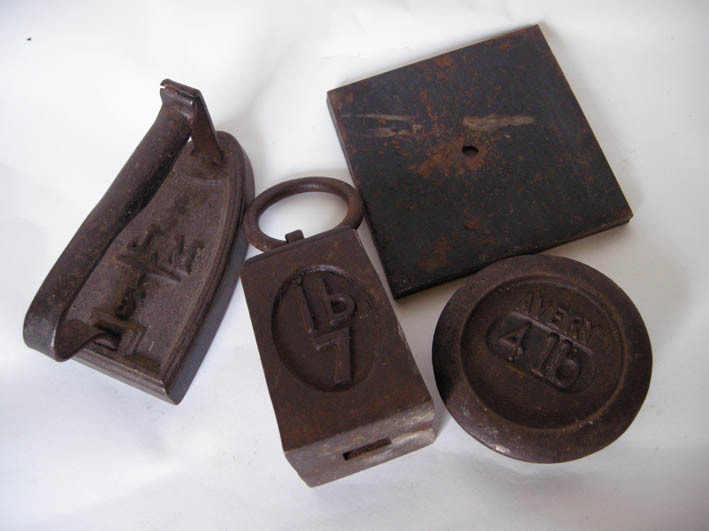 A useful weight for a metal rapping iron is between 1 ½ – 2 lbs. Heavier irons are used for larger work, for example, balloon baskets. Some have a ring at one end that is used to straighten uneven sticks. A commander is a special tool used to straighten large sticks by putting pressure on any unwanted bends or curves using the dog leg end. A wooden rapping iron is useful when working with brown willow as it does not damage the bark. It needs to be made of a dense wood, box or fruit wood and sometimes wooden rappers have metal bars inserted in them to make them heavier. 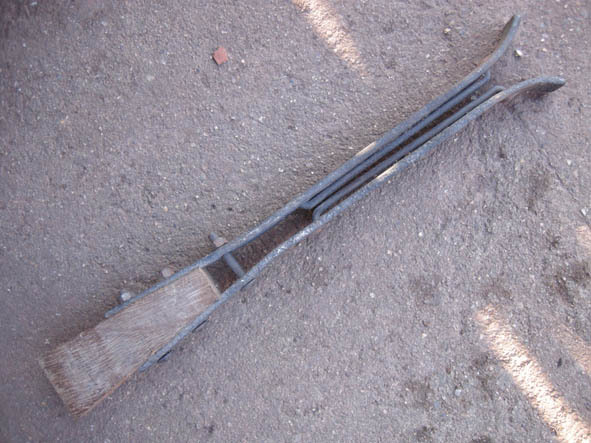 This is a specialised piece of equipment used for green woodwork but is also very useful for shaving down thick split willow pieces for use in basketry, for example as runners on the bottoms of baskets. The ‘horse’ or ‘mare’ is wooden, three legged and has a bar that is held down by pushing forward with the feet to grip the splint being shaved. 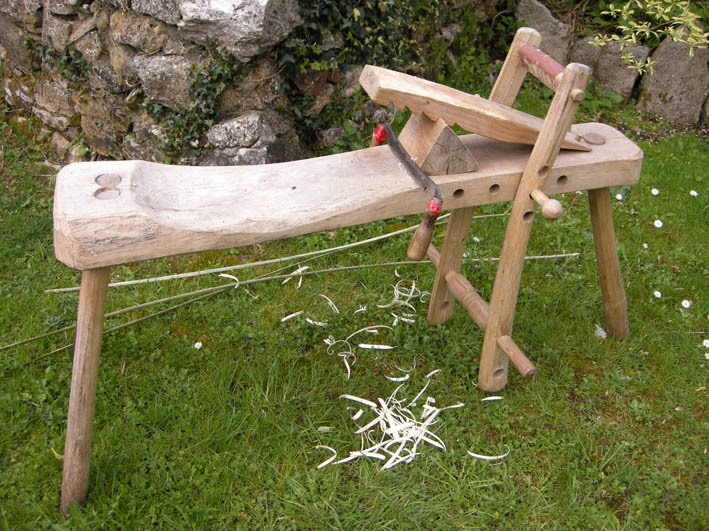 A drawknife is used for doing the shaving. 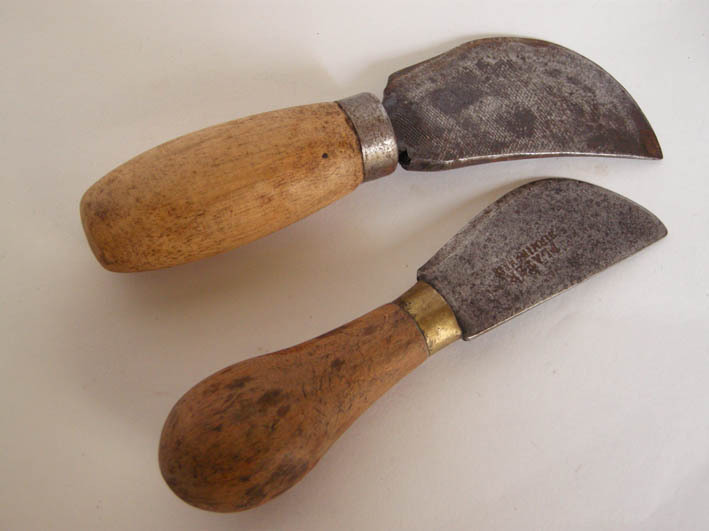 These are used for cutting or trimming the willow rods. The blades should be of the ‘bypass’ not ‘anvil’ design in order to make a clean cut. A narrow blade at the tip is useful so that the cuts can be made close to the work. A set of skeining tools were used when making ‘skeins’; thin ribbon like pieces of willow for lapping handles or when doing very fine work. Cleave: This was a tool, generally wooden, used for splitting willow into three or four down the length of the rod. Shave: A tool for shaving the pith from the back of the skein, generally an adjustable blade held horizontally in a metal or wooden framework. Upright: Two blades at an angle, held vertically in a metal or wooden framework, the skein was pulled through them to take off the edges and ensure an even width. Dry willow needs to be soaked in water to make it pliable enough to work. A galvanised tank such as those used in fields for providing water to cattle is used. 8’ is a good length. A tap or plug needs to be put in at one end so that it can be drained and cleaned easily. 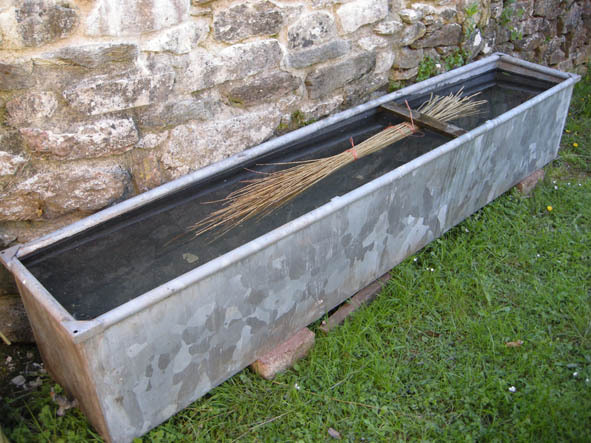 To hold the soaking willow under the water pieces of wood exactly the width of the tank that will fit under the rim should be cut, or the willow may be held down by a piece of galvanised wire attached at each end to a brick or weight. A selection of weights of between 2 – 7 or more pounds is useful. They are used to hold the work down on the lapboard when working. If the weight has a hole in the centre the work may be pinned to the board with a thin bodkin, still allowing it to be rotated.